The RedEyed tree frog is a small frog that will not grow more than 3 to 4 centimetres in length. The females are larger than the males, and tend to be more dominant as well. This gorgeous guy is well known for the colors. It has bright red bulging eyes, orange feet and bright blue streaks on it. When the red eyed tree frog is asleep it hides the brightly colored portions of it. When it runs away, the bright colors seem like they confuse the predator. The Red Eye Tree frog has suction cup feet, or more correctly, suction cups that help its toes to stick to the trees so that it can climb much more easily. 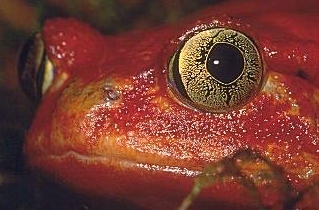 Red Eyed tree frogs are well known carnivores. They exist on a diet of crickets and other small insects, as well as also eating other frogs which are smaller than they are. 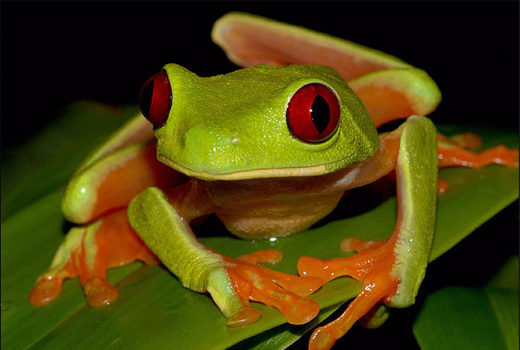 The red eyed tree frogs eat insects that fly as well as crawling ones. The home range of the red eyed tree frog is Mexico. It lives from the southern portions of Mexico to the Honduras, northern parts of South America, as well as Costa Rica. They like the moist habitat of the rainforest, and will be usually found near a water source such as a river, a stream, a pond, or even a river. They have their offspring in and near these of course, the tadpoles need water to survive their youth. Red Eye Tree frog lay eggs. They will lay their eggs on the underneath part of the leaves that hang out over a water source so that when the eggs hatch, they are washed into the water and will survive. The eggs contain fluid that helps to make them heavy enough to fall into the water.